If you are a local vendor and would like to set up a booth at the 2017 Pup-a-Palooza, please fill out the form below. Shop local! Support the Perkins Animal Shelter! 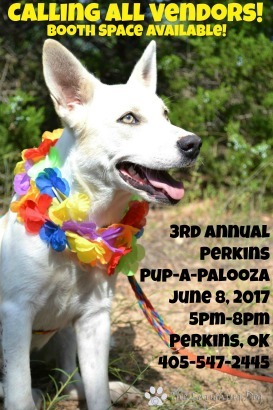 Check out these awesome vendors who will be set up at the 2017 Perkins Pup-a-Palooza! If your community, non-profit organization would like to set up a booth at the 2017 Pup-a-Palooza, please fill out the form below. Stop by and meet the following organizations! See how they can help you and how you can help them!